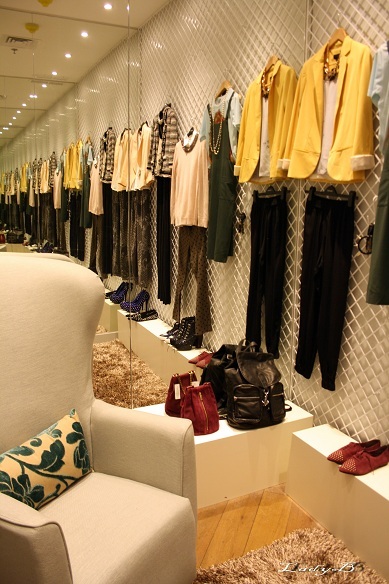 Topshop Kuwait recently launched personal shopping service in their newly opened branch at Marina Mall.. I'm accustomed to this service whenever I visit Topshop Oxford Circus, time saving and fun who would say know to complimentary cupcakes? That's Hannah by the way, pretty cool and ever so trendy..
We had coffee and chatted while browsing the options available for me to try on.. I wasn't planning to shop as much as to check out the service for myself so I'd be able to share with my readers.. They have a selection of services, the time may vary between half an hour or two hours but depends on you.. They even offer a mother daughter service, the honeymooner or a birthday booking and you can bring up to 3 friends to share whatever experience you want.. Being an avid shopper at Topshop, I have half of the stuff Hannah showed me thinking its suits me ..